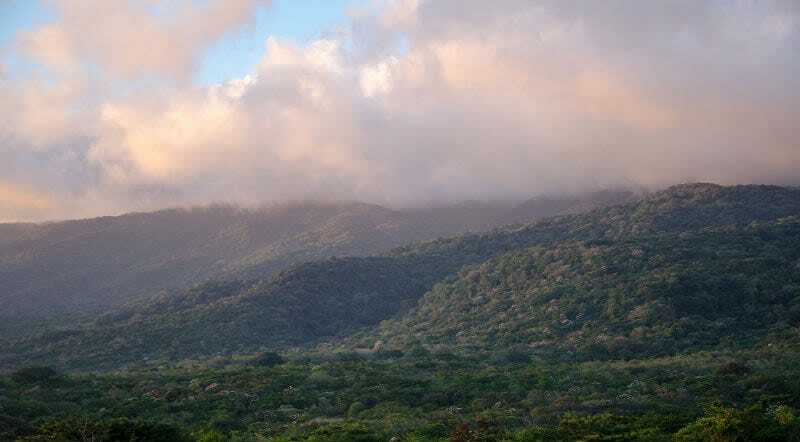 Tropical protected areas aren’t just havens for wildlife. They’re playing a major, and majorly under-appreciated role in mitigating climate change. A new study estimates that on a global scale, tropical protected areas reduced carbon emissions associated with deforestation by nearly 5 billion tons, or 30%, between 2000 and 2012. That’s about half as much carbon as all of our fossil fuel burning produces in a year, or three times the annual emissions of the UK. In other words, one of the most obvious, low tech solutions to global warming—planting trees and keeping them alive—seems to be damn effective. Tropical forests store an incredible amount of carbon—roughly 250 billion tons, according to one estimate. But when we cut them down or burn them, lots of that carbon is released into the atmosphere, where it contributes to our global warming problem. Deforestation and degradation of tropical forests is responsible for roughly a tenth of humanity’s carbon emissions, with hotspots concentrated in the Amazon, central Africa, and Indonesia, where land is being cleared for agriculture, mining, and timber extraction, and for loads of roads. Protected areas—including national parks and monuments, sites that are managed by conservationists, and indigenous lands—can help, especially if they’re sited in places at high risk of development. But on a global scale, few studies have attempted to quantify just how helpful these areas are. The new study, published in Nature Scientific Reports, sought to address this gap, by using satellite snapshots of forest cover loss, prior estimates of carbon stored in tropical forests worldwide, and various datasets on land use, to estimate the carbon emissions that tropical protected areas were able to prevent between 2000 and 2012. On a global scale, the study found that protected areas substantially helped mitigate carbon losses from deforestation. The largest boost came from protected areas in the Americas (370 gigagrams C per year), followed by Asia (25 Gg C per year), and Africa (12.7 Gg C per year). “Our analysis suggests that tropical [protected areas] have played a significant role in conserving forest carbon in recent years, equivalent to a reduction of around 29% of tropical deforestation emissions,” the authors write. A study like this has limitations. The authors only take into account above-ground biomass (that’s tree trunks, branches, and canopies), while ignoring the the tremendous amount of carbon stored in tropical tree roots and soils. The vulnerability of these carbon stocks to land use change is less clear cut. What’s more, the authors note that the effectiveness of protected areas in hoarding carbon be lower than they estimate, if protected areas are being offset by more clear-cutting elsewhere, or if they are occurring in areas that weren’t threatened with development in the first place. “In truth, many of our protected areas—including most of the really big ones—are in remote low-pressure areas,” William Laurance, a tropical conservation biologist at James Cook University who was not involved with the study, told Earther. Still, he noted that the study did attempt to account for variation in deforestation pressure around the world, and even after doing so it found that protected areas helped reduce carbon emissions. “That’s a good result,” he said. While more research is clearly needed, the study’s message—that simply maintaining tropical forests can help fight climate change—is timely, given that world leaders are meeting in Bonn later this month to hash out next steps toward meeting the emissions reductions targets outlined in the Paris Agreement. “Global carbon sinks will be critical for meeting the Paris Agreement, and tropical deforestation risks rainforest carbon sinks switching to carbon sources,” the authors write. “In many of these countries, intact forest landscapes, important for carbon storage across large areas have been reduced and should be prioritised for inclusion,” in protected areas.